In 1980 a pair of stickers were sold for UNICEF. The stickers were part of an action that was directed to raise awareness that hunger was still a problem (and it also was against the sale of weapons to countries were this was the case). 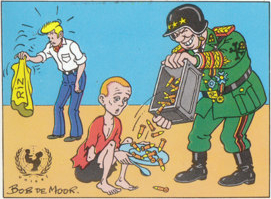 The anti-weapon vs food subject is present in the drawings by Bob de Moor, Dany, Franquin, Peyo and Roba. The 8 stickers represented various drawings made for the occasion by Bob de Moor, Peyo, Dany, Tibet, Derib, Franquin, Roba, and one which we can’t seem to identify (the ‘monk’ saying “La faim? J’ai déjà donné”). In the Bob de Moor drawing you see Barelli holding up an empty sac of rice while a military hands out bullets to an undernourished kid. Note that the military has a South American uniform almost the same one as the ones in “Tintin and the Picaros”. The black and white drawing of this Barelli sticker is available in Bob de Moor. 40 ans de bandes dessinées, 35 ans aux côtés d’Hergé but now you can also see the colored version. 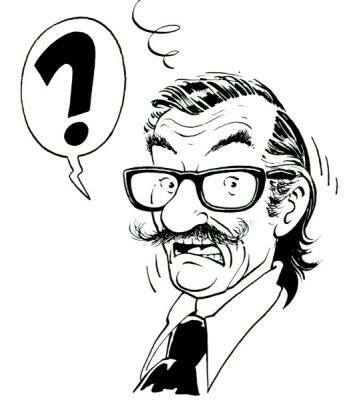 Note that Franquin‘s – excellent and to the point – drawing was also used for a poster action. For those that don’t understand French, Gaston Lagaffe is saying “Are you sure we are helping them?” while giving an undernourished kid the milk bottle rocket.